What is the secret of Peridot's hair? We know this was deliberate - show storyboarder Lamar Abrams apologised to fans on twitter for not drawing Peridot's hair big enough, and promised that it would get bigger in future episodes. What could it mean? 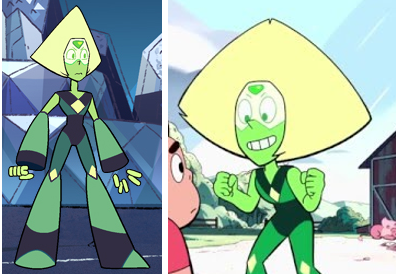 As Peridot becomes more heroic, her hair gets bigger. Like the Biblical Samson, could the size of her hair be tied directly to the state of her soul? When we first saw Peridot, she was totally evil, crushing cute little robot balls beneath her gravity connectors. Proportionally, her hair was tiny. Now Peridot has singlehandedly saved the Earth from the menacing Cluster and called Yellow Diamond a 'clod', she is the greatest of the Crystal Gems. Her hair is now massive in proportion to her body. 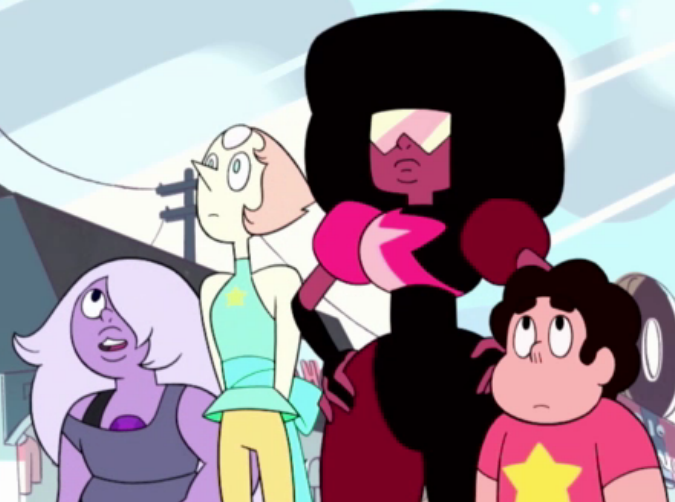 Let us examine the other, lesser Crystal Gems to see if this theory holds water. Of the three, Garnet has the biggest hair. Correspondingly, she is heroic and lovely. Amethyst has long hair too, and she is jolly and warm of heart. Pearl meanwhile has short hair and is starting to go bald. This matches with her menacing personality - she has tried to kill Steven many times be it via exploding spaceship or hologram clone, and is constantly a threat to the other Crystal Gems. Jasper may have long hair, but she covers it up with a hat, much as she covers up her own innate goodness by being totally evil. Yellow Diamond may look like she has giant hair, but it is proportionally small, and the rigid structure on her head is likewise probably a hat, showing her to be irredeemable. What of the populace of Beach City? Let us look at the characters with the least hair. Lars is constantly mean and a jerk to everyone. He has little hair (possibly a wig). Onion has only a tuft of hair to go along with his tuft of human decently. And let us not forget the sinister Mr Smiley, who runs an underground fighting ring. So the theory seems to hold water in 100% of cases. We can tell a character's alignment by the size of their hair, and as they get more heroic, their hair grows. But what secrets does this tell us about the future of the show? One very interesting fact comes to light, that reveals the true evil mastermind behind Steven Universe. 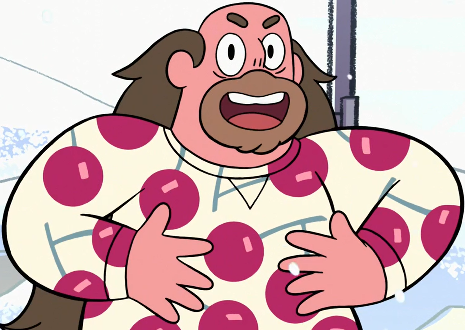 At first you may be fooled into thinking Greg Universe, Steven's father, is a jolly man. But wait - his long flowing hair is falling out, replaced by male pattern baldness. Greg was once a heroic figure in his youth, but has his soul been corrupted by evil? Yes. Remember, Greg lied to Steven about having a broken leg, and took away his power of healing. He also murdered Rose Quartz by making her pregnant. He constantly attacks Pearl with disruptive sonic waves from his CDs. By the state of his hair we can confidently deduce that Greg is the villain of the show, and the mastermind behind Homeworld and the Diamond Authority. Will Steven discover this in time, or will Greg take scissors to his son's hair, turning him as twisted and cruel as him? I can't believe i was actually taking it seriously at the beginning. The theory isn't very well thought out, although some characters, like pearl, seem evil, they aren't Pearl isn't evil she's just misguided and sometimes lets her excitement get to her. Greg, Lars, Mr.Smiley, and Onion aren't antagonistic in the sense that Yellow Diamond is. 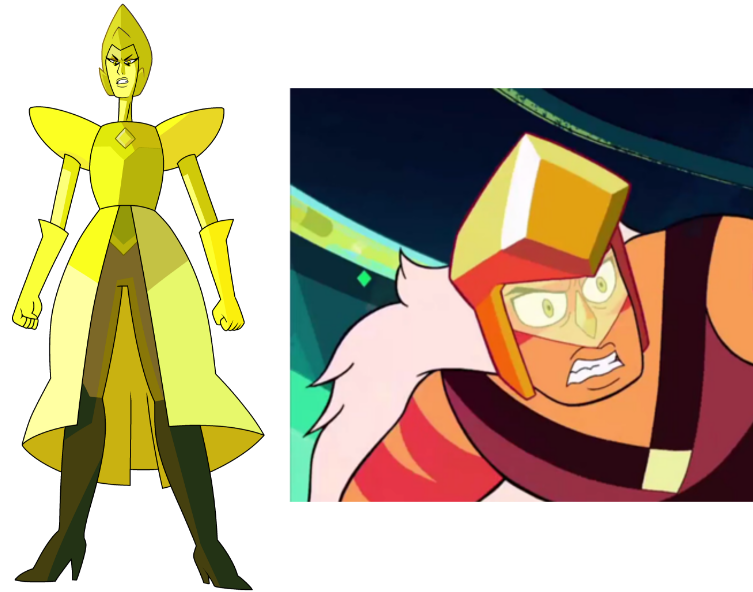 Compare Yellow Diamond to Greg, when Peridot SUGGESTED that they don't activate the cluster Yellow Diamond said she wanted the planet off of the star maps and even saying she wanted the planet to die. Sure Rose gave up her physical form, in a sense she "died" however , to go as far as to say that Greg murdered her? That's ridiculous. I saw a theory that said Rose gave up her physical form so that she could have a somewhat form of redemption.And Lars isn't mean he's just a tsundere because he cares somewhat about Sadie and Steven. 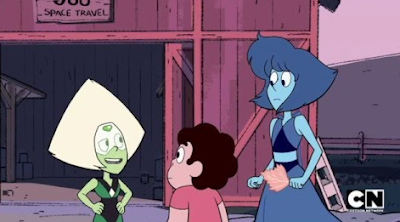 As for Peridot I think her hair could mean her redemption or something like that like Rose. I don't mean offense I just wanted to point out a few flaws within your theory. One of the artists tweeted that they drew the hair too small, and they said the would "draw hair bigger and better next time"